In England during the Hundred Years War, the term “man-at-arms” meant a man who was fully armored and mounted, though ready to fight on foot as well as on horseback. 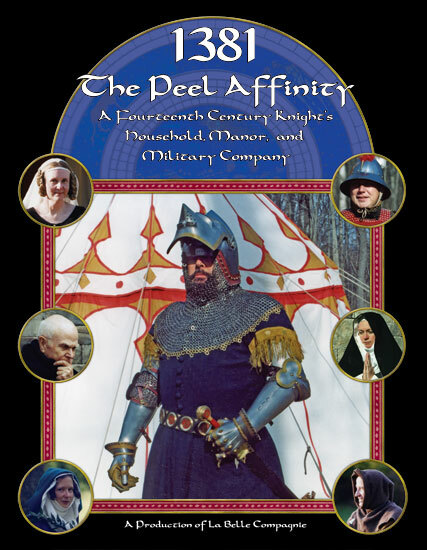 In military service, all knights were men at arms, but not all men-at-arms were knights. Some were squires, and some were even commoners who had acquired the necessary equipment. Keep that in mind when we talk about men-at-arms here on this website. Let’s look at what that definition means. One medieval term for fully armored was “armored cap a pié,” essentially “armored head to foot”. Although the specifics sometimes changed, the sense remained throughout our chosen period. A man-at-arms was expected to have a helmet (often called out as a bascinet), metal body armor, fully protected limbs, and gauntlets (curiously, equivalent protection for the feet is not often mentioned). 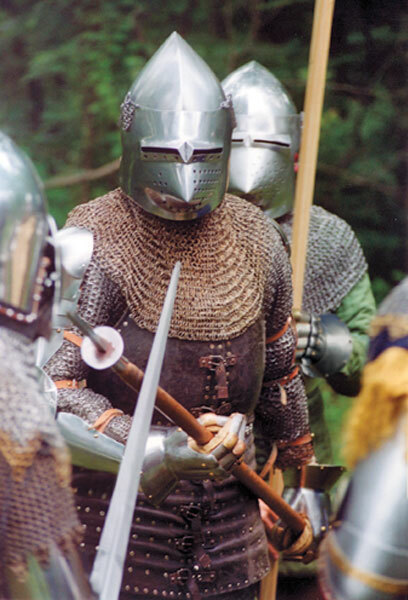 Sometimes options get mentioned such a “a breastplate or mail shirt.” Given the wide variety of equipment that is depicted in medieval art, it is pretty clear that whoever was assessing whether what a man brought to muster matched the specifications had a certain amount of leeway. Check out the sub-menu entry on Armor for more information. Horsemanship skills are vital to a man-at-arms in his role as a mounted warrior. 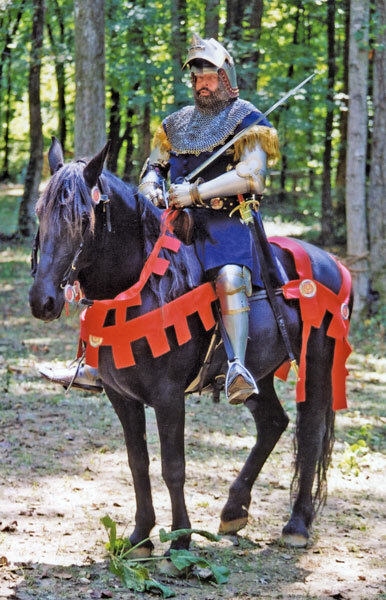 Dom Duarte, king of Portugal in the early fifteenth century and an avid horseman, tells us that in a mounted encounter between swordsmen of equal skill, the better rider will win. Nevertheless, there were many times when the French mocked English horsemanship as being inferior. We do know from Andrew Ayton’s work in medieval records that once the English king stopped offering to pay for warhorses lost on campaign, English knights brought lesser quality horses on campaign. Of course the English were developing their combined arms tactics based on dismounted men-at-arms and archers in close coordination at this time, so maybe providing top of the line cavalry wasn’t a great concern to the English. Nevertheless, English men-at-arms remained cavalrymen as well as infantrymen and often mounted up to conduct a pursuit, and whenever they could, they kept a mounted element as a reaction force. A man-at-arms was expected to be proficient with a number of weapons. 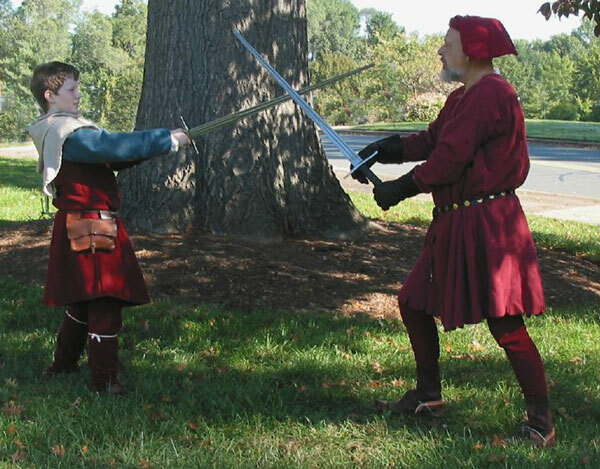 Judging by the techniques presented in Fiore die Liberi’s Flos Duelotorum, a gentleman was expected to know how to handle a dagger, a sword, a poleax, and a spear. It is quite likely that not all fighters were equally adept with all weapons, just like today. Check out the sub-menu item Arms for details on these weapons. For the gentry, training with weapons started early, about the age of seven. Quite likely, children played at it before that, trying to imitate their elders. 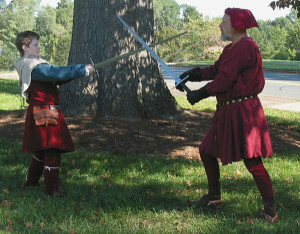 Medieval folk understood that children’s bodies were still developing, and gave them weapons and armor lighter than a man’s equipment until they built up their strength. Lots of general physical activities (running, heaving stones, wrestling, hunting, and so on) were believed to offer benefits applicable to the activities of war. Various surviving medieval sources, such the category of books called “Mirrors of Princes”, advise gentlemen to practice with their weapons daily for an hour or two, often while wearing at least some of their armor. Did every fighter follow that advice? Like today, probably not; some people are always more serious about their athletic activities than others. But in a world where a man might have to defend his life with his own skills, they were likely a bit more motivated. Knighthood was not automatically handed down from father to son, although it seems to have been common for the heirs of the highest nobility. Most English knights were not part of the nobility; that term only applied to men of sufficient rank to get a personal summons to Parliament, which means men of the rank of baron or higher. There were not a lot of men that filled that description at any one time in England. Most knights were part of the emerging gentry class, not commoners but not nobles either. During much of the period of the Hundred Years War, there were many people decrying the lamentable state of knighthood and how it had fallen from the ideals of old, so it seems that many knights were also not noble in the sense that they did not embody the virtues of nobility. Of course there were always men who tried to live up to the ideals of knighthood and strove to embody its virtues (a list that was remarkably variable), but there were also men who would “call themselves knights” but could show no pedigree and, given the vitriol directed towards them by established knights, did little or nothing to live up to the ideals.